Kindly click on the poems in the sub-menu! You will be able to hear an audio of the poems and see a read-along sheet of the poem. Look forward to see these poems spread around quite like the fumes of tobacco that have spread in this world! 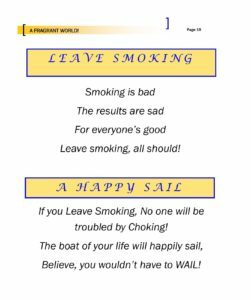 Let’s all be part of making this world a smoking/ Tobacco free place!